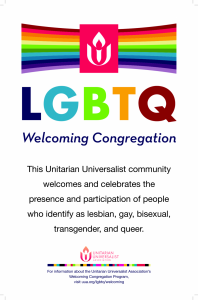 Unitarian Universalist congregations welcome everyone seeking truth and meaning in their lives. We welcome everyone to visit and experience our community. These are some frequently asked questions from people new to the Fellowship. What makes Unitarian Universalists different? Our openness. We don’t claim to have answers to life’s mysteries. Instead, our challenge is to discover life’s meaning for ourselves. But none of us is alone in this task. We help each other in many ways, including sharing our discoveries and our questions. And we have fun at the same time! What do those who attend like about the Fellowship? Our members value our community and the free sharing of ideas and feelings. This is a place of comfort for people whose spirituality doesn’t always fit within the confines of traditional religion, or within any religion. We are gentle with each other, and respect each others’ ways. What is the religious background of your attendees? Our Fellowship is a haven for people of many religious backgrounds and beliefs. Some of our members were raised in another faith, but found they couldn’t accept the beliefs they were expected to adopt. Other members are not religious in the conventional sense; some do not believe in conventional notions of god. However, we are all interested in meaning, in morality, in the larger questions of life. Here, we can talk about deep issues without fear of censure. What can I expect to experience in a typical service? We sing, share readings, meditate, and pray. Our sermons cover a wide range of topics and styles. On a given Sunday morning, you may hear about history or the environment, Buddhism or humanist philosophy, the Bible, or a recent news event. Sermons will inform and inspire, evoke emotion, and comfort you from the challenges of everyday struggles. Absolutely. One of our central tenets is respect for everyone. From 10:30 to 11:30 a.m. on Sunday. We have coffee and light refreshments afterward, so plan on staying a little later to get to know us. Dress is casual. Jeans and a casual shirt are fine. Some people dress more formally, so you can too, if you like. Of course! We would love to meet them! Not at all. Our way of thinking is about free choice. The right of personal conscience is one of our basic principles. Should I put money in the collection basket? That’s up to you. You can add a few dollars if you want, or nothing at all. First-time visitors are encouraged to be our guest.